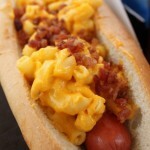 When the menu at Friar’s Nook received a New Year’s makeover, Mac & Cheese-loving hearts went all aflutter over the spins on this classic comfort food. Bacon Cheeseburger Macaroni and Cheese debuted alongside of Blue Cheese Macaroni and Cheese with Balsamic (and a more traditional take topped with Panko crumbs arrived as well). So, changes at Friar’s Nook aren’t entirely unexpected, but we have to admit that we were a little surprised to spot another one so soon: The Blue Cheese Macaroni was recently replaced on the menu with Pot Roast Macaroni and Cheese. So, prepare yourself for a bowl of comfort food topped with hearty helping of… MORE comfort food! The first thing I noticed was the topping on this dish is less involved than its counterpart, the Bacon Cheeseburger Mac & Cheese. 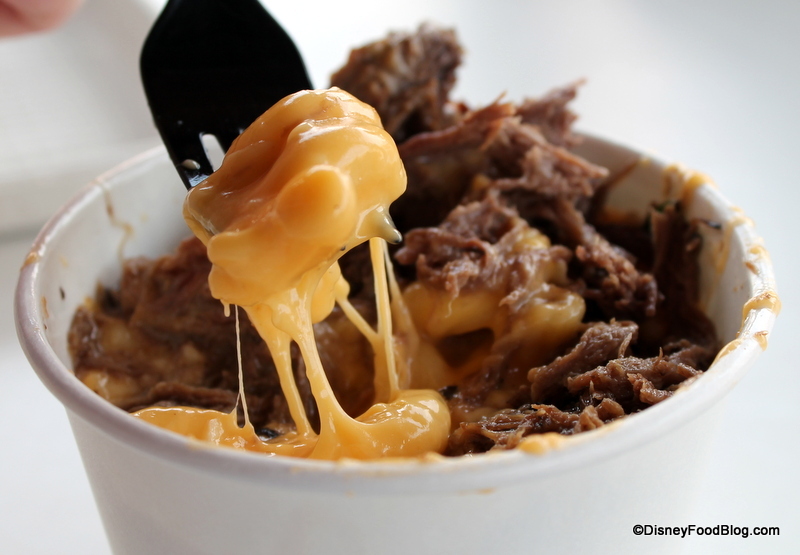 Where the Bacon Cheeseburger Mac is topped with ground beef, bacon, lettuce and tomato, the Pot Roast Mac & Cheese is topped with simply that: a pile of pot roast on top of the macaroni. Things started out great: the pot roast was very well-prepared. Tender and juicy — and mine had very little in the way of fat. 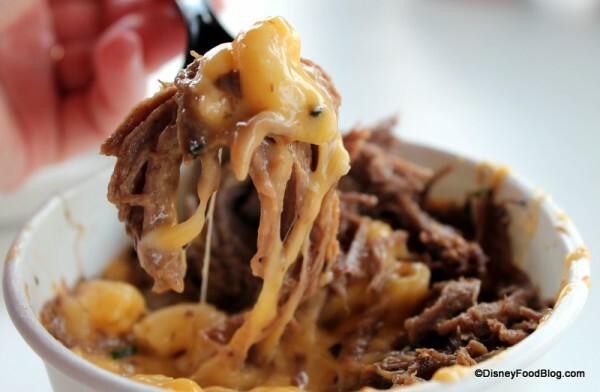 OK, not that that’s huge concern when you’re eating beef-covered mac and cheese ;), but my point is, the meat was really good, and actually tasted homemade. The second component is, of course, the Mac & Cheese. There is even more cheese to this mac & cheese than the name implies. 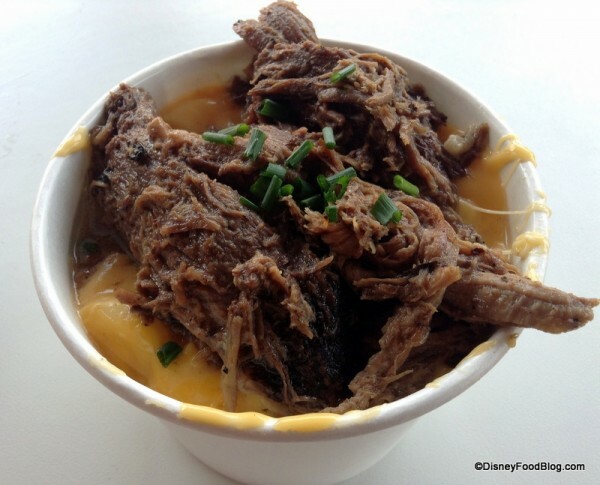 For those accustomed to the mac & cheese found at buffets around Disney property, or commonly offered as a Kids’ option, there seems to be more shredded cheese in addition to the melted cheese sauce that we’re used to. 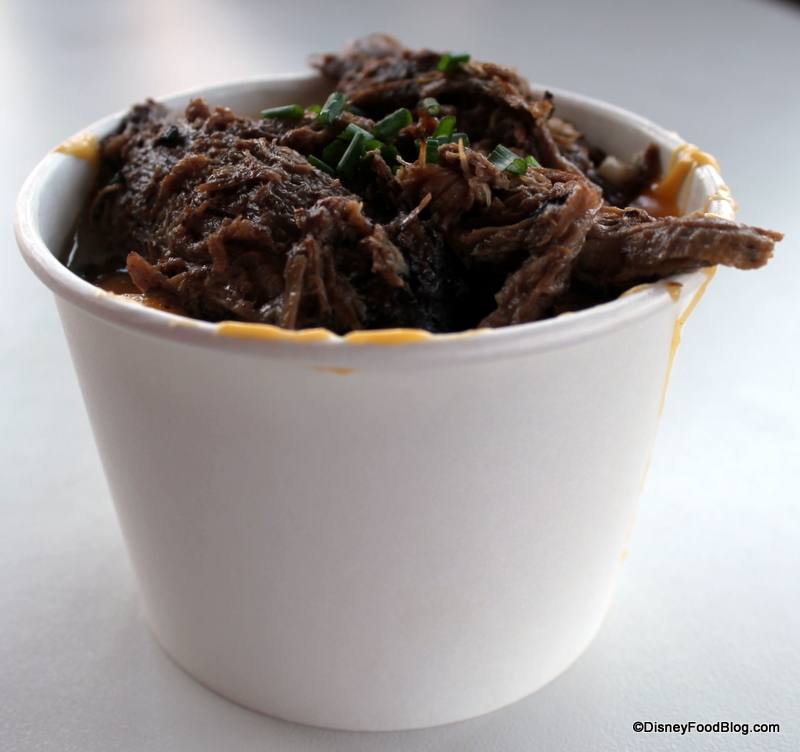 While the flavor is outstanding, and the cheese tasted great with the pot roast, the extra cheese lends a heaviness to this dish that – at least for me – was overwhelming. I had to wave the white flag of surrender much sooner than I wanted to, because even though the flavors were great, it was just too much. The bowls of Mac & Cheese seem small for the price at first glance ($8.99 for this one), but it is a LOT of food for the buck, and I’d absolutely recommend sharing because it is so, SO rich. Two thoughts on this menu update: one, I wish they had kept the Blue Cheese Mac on the menu with this new addition, since it was cool to have a vegetarian option that was pretty unique. Two, I think the timing on this one might be a wee bit off. Friar’s Nook has only outdoor seating, and now that the temps are really starting to rise in Florida, I have to admit…curling up with this dish when it’s 95 degrees is not the most appealing thought 😉 . If the mac & cheese menu at Friar’s Nook holds up, though, I do like the thought of trying this dish again in the cooler months. The concept is really fun, and the dish is quite well made. I think there is potential here for a favorite. Something good to know: Prior to January, I had a really hard time ever finding Friar’s Nook open… like, ever, since it is a “seasonal spot” reserved for high-crowd days. Ever since the menu revamp, though, I have seen it open on just about every Magic Kingdom visit, particularly in the midday hours. 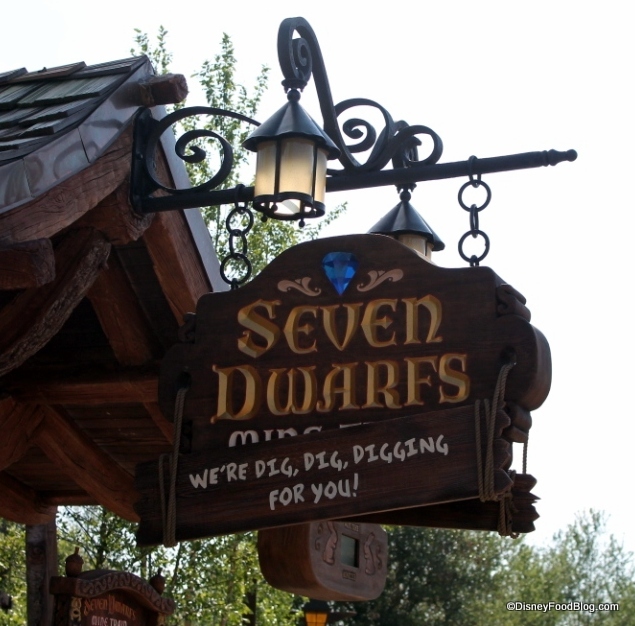 So, I think hopes of catching Friar’s Nook open are higher than ever – the spot is prime, being in very close proximity to the Seven Dwarfs Mine Train, which will officially open to the public on May 28th. And they gotta be ready, ‘cuz you never know when Doc, Sleepy, Bashful, Sneezy, Happy, Grumpy, or Dopey may get a hankerin’ for some Pot Roast Mac & Cheese 😉 ! 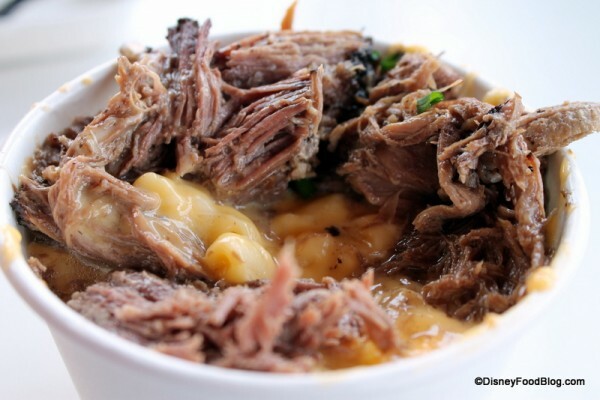 Would you like to try the Pot Roast Macaroni and Cheese? Please let us know with a comment! I guess catching Friar’s Nook open is hit or miss. 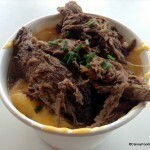 We were unlucky: We went to try the Pot Roast Mac & Cheese on Saturday, May 10 at around 5:30 p.m., and the Nook was closed. 🙁 Hope to have better luck next time. 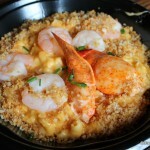 Also, we LOVED the Blue Cheese Balsamic Mac & Cheese and agree that it shouldn’t have been taken off the menu! When we were at WDW last month, we went to Friar’s Nook specifically to try the Blue Cheese Mac ‘n Cheese and absolutely loved it. So disappointed to hear it’s been taken off the menu already! People must not have been buying it. The pot roast version looks too heavy for my taste, especially, as you said, for the hot summer months. Thanks for the review! 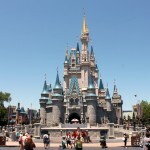 We are going to the Magic Kingdom this coming Friday! Hoping it will be open as it sounds delicious! Also hoping that the Mine Train will be open for a bit! Wish us luck!! Tried the pot roast last Friday (may 10) and it was fantastic, even in 90* Florida sun. Split between three people for snack it was a fantastic choice. 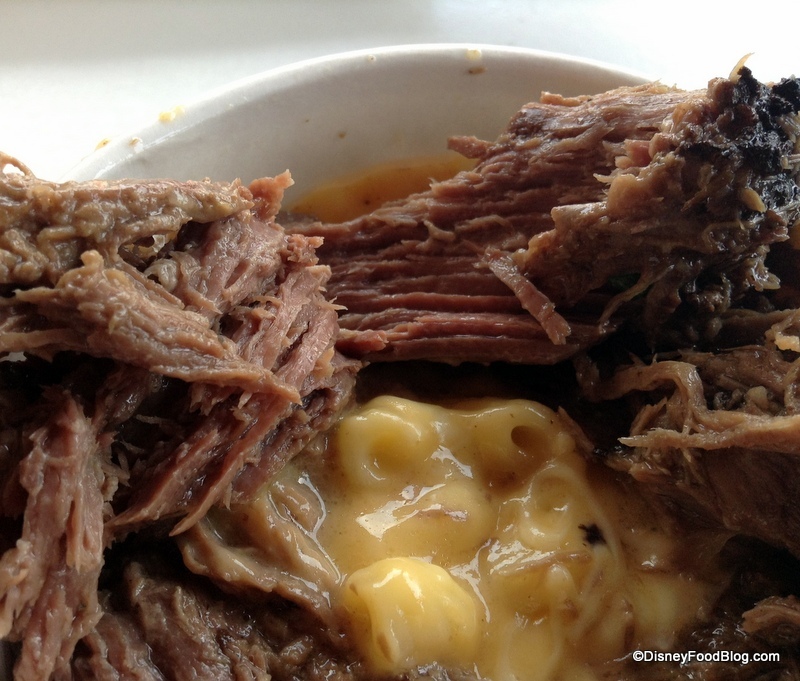 Pot roast was lovely, Mac was quite cheesy. Wish the hours were longer. They also gave a frozen souvenir slush mug people were coveting…not sure if it can be found elsewhere. 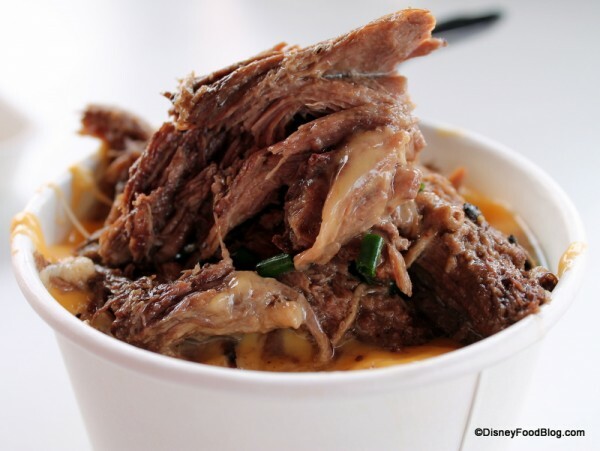 If you like pot roast, try it…If you don’t want the cheese head over to Gastons for the roasted pork shank. It will appeal to the turkey leg croud, but it’s a different kind of delicious for sure. I didn’t get there this trip. I was thinking about the blue cheese version of mac and cheese and thought it may be an allergy thing. I am allergic to penicillin and was told to avoid blue cheese. Or maybe more people just want simpler foods. Amy – I was thinking this will be perfect in January! 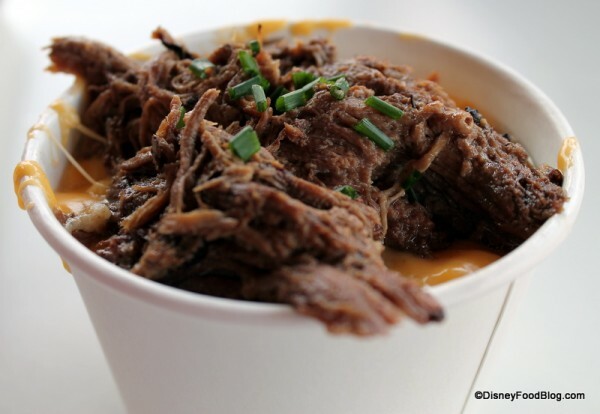 And there’s not a thing wrong with pot roast mac and cheese for breakfast ;)! Kimberly – so sorry you missed it! Here’s to the next trip! Joy – I’ll keep my fingers crossed for you on both counts :)!! Have a great time! DB – split between 3 would be about right for me, too. I think I made it a third of the way through! Thanks, too, for the note about the cup! Fay – Hi! 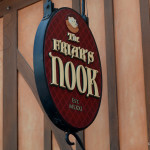 I believe so – Friar’s Nook is listed under the restaurants that accept Quick-Service credits. Hope you enjoy! Nancy – that’s a good point, I hadn’t thought of it from an allergy perspective… Hope you had a great trip this past go ‘round!